Fortune cookies contain words of wisdom or witty sayings. They also have numbers that you can play in the lottery. and re-load the web page. Click the OPEN button to read your fortune. 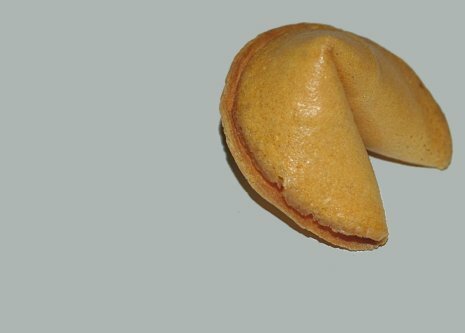 Fortune cookies are cookies that have been folded while hot to contain a small piece of paper with a "fortune" or a prophesy. 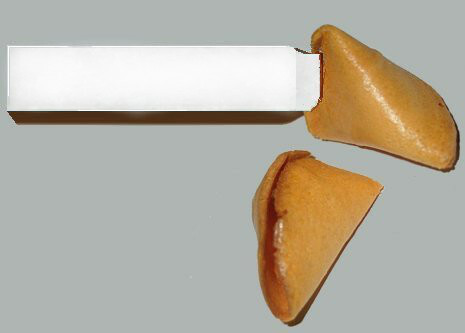 The cookies are crisp when cold, so the paper with the fortune can only be retrieved by breaking the cookie. The cookies are made from flour, sugar, vanilla and cooking oil or butter, although hydrogenated fats are used by some commercial manufacturers to prevent rancidity. The messages in the fortune cookies may contain words of wisdom, popular sayings, or vague prophecies. Sometimes the messages contain a list of numbers which may be used to play the lottery. A PowerBall drawing on March 30, 2005, produced 110 second-place winners that matched the first 5 of the six numbers. Normally, there are only four or five second-place prizes. Lottery officials initially thought that there had been some kind of fraud, but they soon learned that the winners had selected the numbers from Chinese fortune cookies. Each of the second-place winners got $100,000, or $500,000 if they paid an extra dollar for the Power Play option. Fortune cookies originated in California at the beginning of the 20th century. They were based on a Japanese cookie called tsujiura senbei that has a small slip of paper wedged at the bend of the cookie rather than inside the hollow portion. Fortune cookies are served as a dessert in Chinese restaurants in the United States, but they are not used in China. Print the fortunes on white paper and cut them into slips of about 2 1/2 inches by 3/8 inches. Cut a stencil out of a plastic coffee can lid in the shape of a 3-inch disk. Preheat oven to 350°F. Whip the egg whites until stiff and chill. Beat the butter and the sugar until creamy. Add the flour and blend in, then add the vanilla and blend again. Add the chilled egg whites and mix on low until well incorporated and the batter is smooth. With a small offset spatula, spread the batter through the stencil to form circles on a baking sheet lined with parchment paper. Bake about 4 cookies per sheet to have time to fold them while they are still warm. Bake until light golden brown, 7 to 8 minutes. Remove the baking sheet from the oven. Quickly place a fortune across the center of each cookie. Fold the cookie circle in thirds over fortune. Then turn sideways and bring opposing sides together and pinch. Let cool.